So today was a big day, well only if you’re at Nordstrom, for their annual “Anniversary Sale”. Or maybe you’re the type to get pumped when the weather allows for daily use of boots, sweaters, leather, and an endless variety of skinny jeans. If you live someplace where it’s cold 70% of the time like I used to in America’s Northwest, the place where your daily staples never reach sale. * In Hawaii we don’t have such a luxury, instead our leather molds if left idle for too long. Ewww is right. So, if you need fabulous winter staples, sometimes Norstrom’s Anniversary sale in July is a great place to start. My experience is the shoes are where it’s at, and staples you need every year. Nordstrom partners with companies to make often exclusive pieces that they launch in the heat of summer for a reduced price, typically 30% off. It’s also a way for the retailer to test the market for fall. What do customers want? And a lot of what they offer is their own house-made lines. Leith, Stem, Trouve, Halogen, 1901, those are just some of the many in-house lines, and some really lack in quality depending on the item. Just beware. All that said, there are some good-looking on trend pieces worth investing in if you’re in the market. Been eyeing some Pedro Garcia pumps, but are turned off by the $500+ price tag? You’re in luck! You can snag them starting tomorrow (if you’re a rewards card holder) or July 19 for just over $300. Often times Nordstrom brings in it’s all-star products at a huge volume to make up for the reduced selling price. All in all, it’s a win win. *On a side note, if you do need boots in December, you might be hard-pressed to find the ones you really want, in your size. This exact scenario happened to me almost 4 years ago when I thought it was a decent enough idea to move from 80 degree weather Hawaii to a chilling (though rare) 16 degree Portland, Oregon (for a new job). I moved without the winter staples I needed. Made sense at the time, thought I’ll just get what I need when I’m there. Weeks of freezing ensued. I did find a great pair of flat equestrian style Cole Haan boots that I’ve re-soled twice, and I still have the, from Nordstrom. But if I had known about the Anniversary sale, I may have saved myself some frenetic shopping that winter. This entry was posted in Accessories, bargains, events, fashion, styling, women's clothing and tagged boots, clothing, fall, nordstrom, sale on July 11, 2013 by pualana. We love our moms. We honor our moms this Sunday (May 12) with Mother’s Day. But how will you show your gratitude to her for all the years of wiping up your snot and other things only a mom can do with love. Sometimes the best gift isn’t a “thing” at all. 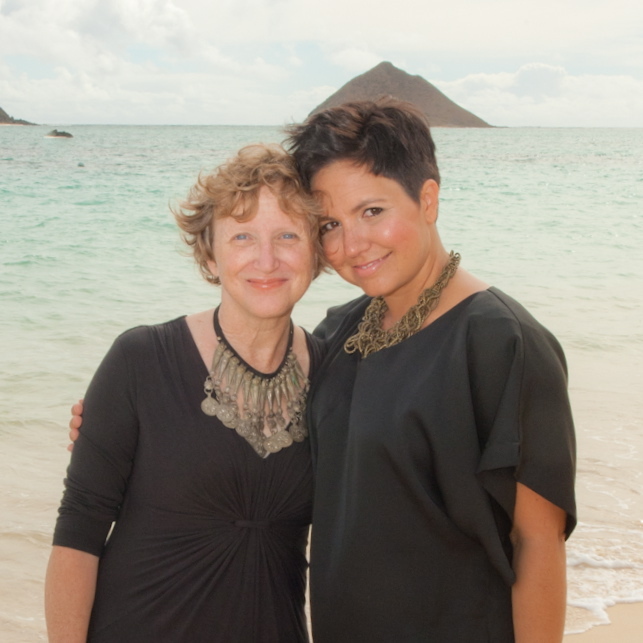 Right now with every styling consult purchased for Mom, I’m offering a free hour for you. So for $175 I’m offering 2 hours of my styling services (either at home or out shopping) plus an extra hour for you! Maybe she just needs a little help figuring what to wear with what, or how to modernize her look, whatever it is I can help. Because we love Mom, and she doesn’t have to know you got something out of this too! Offer good through May 31, 2013. This entry was posted in sale, service, styling and tagged clothing, Mom, Mother's Day, Personal Shopping, style, styling on May 8, 2013 by pualana. Finding a pair of dark wash denim with a universally flattering skinny/straight leg is actually harder than you might think. So when I was in NYC last month checking out the massive UNIQLO store I was stunned to find these nice jeans at this crazy low price: Just $9.90. I scored a pair for my mom and myself. After several wears, it’s held up and totally worth sharing with you. Note, the UNIQLO’s online stie is limited in it’s size offerings when I checked, but I’m hoping they will be stocked soon. This entry was posted in bargains, fashion, sale, women's clothing and tagged clothing, uniqlo on February 19, 2013 by pualana. Glamour shouldn’t stop at the pool. I love dressing as if I’m in St. Tropez, even if I’m just at the public pool down the street. Dress for how you want to feel. Let your outfit transform you, glamourpus! This entry was posted in styling and tagged clothing, fashion, glamour, pool, st tropez on October 15, 2012 by pualana. Wondering just why hiring a stylist might be beneficial for you? How about having a list of pre-selected items to chose from! Get the best looks plucked from all over the web and in-stores without having to leave the comfort of home. That’s just what we can do for you. And it’s so easy when using Pinterest. 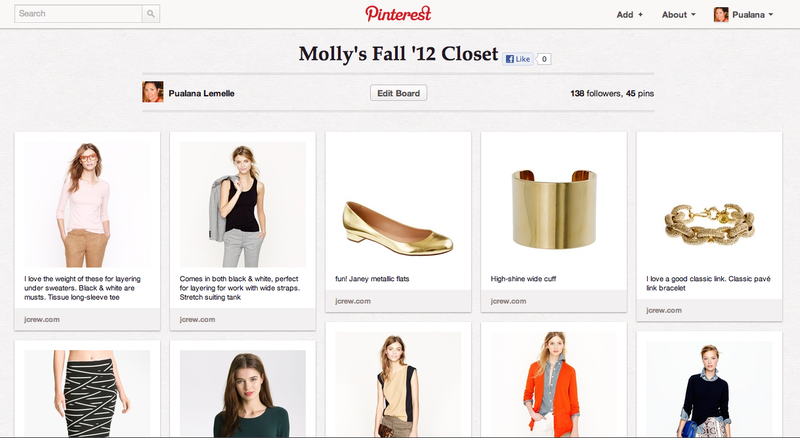 Using a virtual Pinboard I can create wardrobe ideas for clients to choose from & order direct from merchants. and a long-sleeve black cardigan. With so many dizzying choices to choose from it’s easy to get distracted. We’re well versed in fit and quality, so you can trust our recommendations will work for you. Follow us on Pinterest. Need some ideas or want us to work on a wardrobe for you? Let us know! This entry was posted in styling, women's clothing and tagged clothing, diy, shopping, style, wardrobe ideas on October 2, 2012 by pualana. Lots of fabulous outfits and more for your pleasure. Join us this Sunday, September 9th from 2-5pm for a very GLAM open house. Contact me for more info and prices (pualana@gmail.com) or use the RSVP form below. Thanks for shopping! DVF wrap dress 10, various necklaces & pashmina scarf. Catherine Malandrino ankle length deep V cotton pleated dress. Check out the detailed hem! Layered Banana R. sweater over Tracey Reese Plenty dress. Very 60’s Bollywood to me. Vintage 60’s floor length gown. I wore this in 2007 to Misrach’s opening at the former Contemporary Museum, Honolulu (TCM)! Been holding on to it ever since. Size 8, slim in the ribs, had it expertly tailored to fit. DM me if you need exact measurements. Marc by Marc Cord. Navy peter-pan collared Jacket. Chain necklace, Vegan vest, Tracey Reese Plenty 2 part dress. Prepping our hard working model! This entry was posted in Accessories, sale, styling, women's clothing and tagged bangles, clothing, fashion, personal stylist, shopping, style on September 6, 2012 by pualana.